In a large stockpot over medium heat, saute the garlic, crushed red pepper, and dried basil in the olive oil until the garlic is translucent, about 3 minutes. Add the beef base, tomato puree, and vegetable stock. Stir to combine. Raise the heat to medium-high, bring the mixture to a boil, and reduce the heat to low. Simmer the broth for approximately 10 minutes, stirring occasionally. Add the chickpeas, kale, and green beans and cook for an additional 5 minutes, just to wilt the kale and warm the chickpeas and green beans through. Season to taste with salt and pepper and serve hot. Heat marinara sauce to boiling in a large, wide skillet over medium-high heat. Turn the heat down to a simmer. Carefully, one at a time, drop the eggs into the simmering marinara sauce, keeping a space of at least 1/2 an inch between them. Poach the eggs in the sauce for about 4 minutes; then cover the pan with a securely-fitting lid and continue cooking the eggs for an additional 3-4 minutes, just until the whites are fully set and the yolks are soft and runny. (You can continue to cook them an additional minute or two if you prefer firmer yolks, but remember that they’ll continue to firm up a bit even after you remove them from the heat.) Spoon the eggs and a generous portion of sauce into individual bowls (we give 2 eggs per adult) and serve alongside bread and hearty greens. Preheat your broiler. In an 8-inch nonstick skillet over medium heat, saute the onion in the olive oil until translucent. Add the zucchini and mushrooms and cook, stirring occasionally, until the vegetables are softened (about 3-5 minutes). Add the tomatoes, season with salt and pepper, and continue to cook an additional 3 minutes, until the tomatoes begin to break down slightly. Pour the beaten eggs over the vegetable mixture and stir to combine. Add the cheese and mix to incorporate, then let the frittata cook on the stovetop until the sides and bottom are set, about 3-5 minutes. Put the frittata under the broiler for an additional 5 minutes or so, until puffed and golden brown. Remove, let cool slightly, then turn out onto a cutting board and slice into wedges to serve. In a large bowl, toss together the bread cubes, shredded apples, brown sugar, cinnamon, and nutmeg. In a separate bowl, whisk together the milk, cider, eggs, maple syrup, and vanilla extract. Pour over the bread mixture and stir to thoroughly combine. Cover and refrigerate a minimum of 1 hour, or up to overnight. Preheat the oven to 375. Lightly grease (or line) 18 muffin cups. Fill the prepared cups with the soaked bread mixture — you can fill them all the way to the top for this recipe, since the “muffins” won’t expand much. Bake at 375 for 30-35 minutes, or until nicely set and golden brown on top. Let cool a few minutes, then run a butter knife around the outsides of the “muffins” before removing from the pans. These are best served warm, whether it’s fresh from the oven or heated in the toaster. In a dry nonstick skillet over medium-high heat, saute the prosciutto until it becomes crispy and curls around the edges, about 3-5 minutes. Set aside. Toss the apples and greens in a medium-sized bowl. In a small bowl, whisk together the syrup, vinegar, and oil, and drizzle over the the apples and greens (remember; you can always add more dressing, but you can’t take it out, so start slowly). Toss to coat, taste, and adjust the seasonings. Add the prosciutto and toss gently until everything is combined. Combine the chicken stock, water, beans, carrots, onion, and garlic in a slow cooker. Add the salt, pepper, herbs de provence, and bay leaf, and stir to combine. If using the cheese rind, add it to the mixture. Cover and cook on LOW for 8-10 hours, until the beans and carrots are very tender. Once the soup is cooked, add the lemon juice, balsamic vinegar, and olive oil, and puree with an immersion blender or in a conventional blender until you achieve the desired consistency (we liked ours mainly smooth, with a few whole beans left here and there). Taste and adjust the salt and pepper before serving. Place the chicken pieces in the bottom of a slow cooker. Sprinkle the leeks, carrots, and celery over the top. Pour in the chicken stock and water. Season with the salt, pepper, thyme, and vinegar. Cover and cook on LOW 2-3 hours. Add the mushrooms and continue to cook for an additional 8-9 hours (I started mine at 7 p.m., added the mushrooms at 10 p.m., and turned off the slow cooker at 7 a.m.). Turn off the slow cooker and remove the chicken pieces from the soup. Shred the meat from the bones; discard the bones and skin, and return the chicken meat to the broth. Add the cooked rice and stir thoroughly to combine. Taste, adjust seasonings, and serve hot. Preheat the oven to 375 degrees and lightly grease a 9-inch round cake pan. Cream together the butter, yogurt, brown sugar, and maple syrup until smooth. Add the eggs, one at a time, beating for about 30 seconds after each addition. Fold in the grated carrot and apples. In another bowl, combine the flour, salt, baking powder, baking soda, cinnamon, and nutmeg. Gradually add the dry ingredients to the wet mixture, until everything is just combined. Fold in the vanilla. Pour the batter into the prepared cake pan and bake at 375 degrees for 40-45 minutes, until a toothpick inserted in the middle of the cake comes out clean and the top is springy to the touch. When we tested it, I swear, this stuff stayed warm and pliable in a preheated thermos for four hours. It just needed a very quick stir and it was ready for dipping! Boil the carrots in the water or chicken stock until very tender (I confess I did this one in my microwave for convenience — it took about 7 minutes). Use a blender, food processor, or immersion blender to puree until smooth. In a large saucepan over medium heat, melt the butter and whisk in the flour until it forms a paste. Cook, stirring constantly, for 2-3 minutes. Slowly pour in the milk and chicken stock, whisking, until all the liquid is incorporated and there are no lumps. Turn up the heat to medium-high and let the sauce bubble for about 5 minutes, until it’s thick enough to coat the back of a spoon. Turn the heat to medium-low, add the veggie puree and cheeses to the sauce, and stir until the cheeses are melted and everything is combined. Season with salt and pepper. Add 1/2 cup of salsa and mix thoroughly. Taste and add more salsa if you prefer. Serve immediately with chips, or pour into a preheated Thermos and pack in a school lunch. Queso variations: Stir in 1 cup of leftover chili, 10 oz. of chopped frozen spinach (squeezed dry), or 1 cup of black beans cooked with 2 tablespoons of chopped onion, 1 tsp. each cumin and chili powder, and 1/2 cup crushed tomatoes. In a large skillet over medium-high heat, saute the garlic and scallions in the olive oil and butter until translucent. Add the zucchini and cook for 2 minutes; add the corn kernels and a pinch of salt and pepper and cook, stirring occasionally, about 7-10 minutes or until the zucchini is softened and the corn is cooked. Adjust the seasonings to taste and stir the basil in at the last minute, right before serving. 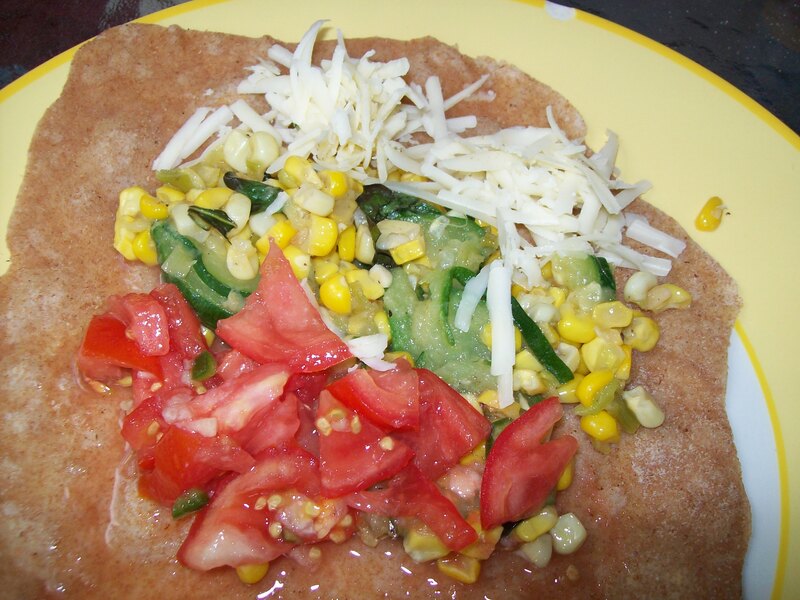 We had ours in homemade whole-wheat tortillas with a quick fresh salsa of chopped tomatoes, jalapenos, garlic, onion, and lemon juice, and a sprinkle of sharp cheddar cheese. These bars came out chewier and softer than a traditional granola bar, probably because of the banana in the binder. Make sure to let them cool almost completely before cutting them so you don’t have a mess on your hands. Preheat the oven to 400 degrees. Combine the oil, maple syrup, honey, and salt in a small saucepan over medium heat. Cook, stirring constantly, for 2-3 minutes or until the honey begins to melt and the mixture comes to a simmer. Add the cocoa powder and banana and cook for 2 additional minutes. Remove from the heat. Puree the mixture (I used a hand blender; you could use a traditional blender) until completely smooth. Add the oats and pretzel chunks to the liquid mixture and stir until coated thoroughly. Add the chocolate chips and mix to combine. Spread the granola mixture into a lightly greased 9×9-inch baking dish and bake at 400 degrees for 20 minutes, until set and slightly dry around the edges. Remove from the oven and immediately run a sharp knife around the sides of the bars to prevent sticking. Let the bars cool almost completely before turning out of the pan and cutting into squares. I got 16 servings from one pan. In a 13×9 glass baking dish placed directly on the stovetop, melt the butter and add the brown sugar, cinnamon, and nutmeg. Stir over medium heat to melt the sugar and combine into a caramel-like sauce. Add the two tablespoons of half-and-half and stir vigorously until smooth. Pour in the peaches and berries, stir to coat, and let cook for 2-5 minutes, until the fruit is all thawed and evenly coated. Remove from the heat and allow to cool slightly. Slice the bread into 1/2 inch slices and arrange over the top of the fruit mixture, filling the gaps as tightly as possible while keeping it in a single layer. Whisk together the eggs, milk, 1/2 cup of half-and-half, and 1/4 tsp. of cinnamon until evenly combined. Pour evenly over the bread and press down to fully soak the bread in the custard mixture. Cover the dish with foil and refrigerate for 8-12 hours. Preheat the oven to 400 degrees. Bake the casserole, covered, for 35-45 minutes, or until the bread is tender and the juices from the berries and peaches begin to bubble up around the sides. Serve immediately. I call this “go-to” because it’s what I usually default to when I want to make a quick, flavorful piece of chicken for salads, sandwiches, or just a last-minute meal. The kids love the flavor, which is bold but not too spicy, and I find it works in just about any dish. Preheat a grill or grill pan over medium-high heat. Combine the seasonings — oregano through pepper — and sprinkle evenly over both sides of the chicken pieces. Brush the grill with olive oil and cook the chicken for about 6-7 minutes per side, until cooked through but not dried out. Let the chicken rest for about 5 minutes before slicing. There are lots of recipes out there for tabbouleh. I have no idea how authentic mine is, but this is how I’ve taught myself to make it, and it’s how we like it. After soaking the bulgur wheat, transfer it to a large bowl, straining first if there seems to be excess water. Add the garlic, onion, parsley, grape tomatoes, and cucumber and toss to combine. Season with the lemon juice, salt and pepper and mix well. Add the olive oil gradually, starting with just a couple of tablespoons, and keep tasting as you mix the salad to determine whether or not you’ll need more oil. I usually like more than I think I’ll want, just to keep it really moist and to round out the flavor. Just make sure to use really good extra-virgin olive oil. Let the tabbouleh sit for at least 15 minutes before serving — an hour or more is even better. This batter recipe will make a sort of odd amount of batter — it’s enough to bake a 9×13 sheet cake, as well as either 2 miniature or 1 standard-sized loaf cake. Preheat your oven to 350 degrees. Lightly grease a 9×13 baking dish and a loaf pan, or whatever combination of pans you intend to use. In a large bowl, whisk together the dry ingredients (flour through salt) until combined. Add the hot water and stir quickly until the dry ingredients are just moistened. In a medium bowl, beat the eggs, milk, vinegar, vanilla, and vegetable oil until combined. Pour into the dry ingredients and mix gently until the batter is smooth and evenly combined. Fold in the graham cracker pieces and marshmallows. Pour the batter into the prepared pans and bake at 350 degrees for 30-45 minutes, until the cake pulls away from the sides of the pan and a toothpick inserted in the center comes out clean. In a medium bowl, combine the potatoes and corned beef; set aside. In a large nonstick skillet over medium-high heat, melt the butter and oil together. Add the peppers, onions, and garlic; sprinkle with salt and pepper, and cook until soft, about 5-7 minutes. Add the corned beef mixture to the pan. Stir to combine everything thoroughly, then spread the mixture out evenly in the skillet and press it down with the back of a spoon. When it’s even, place a large, heavy pot on top of the hash and weight it down (I used a full tea kettle for weight, but you can use large cans, too). Allow the hash to cook under the weight for about 7 minutes, checking occasionally to make sure it doesn’t burn; the weight will help develop a nice crispy texture. When the hash is deeply browned and crunchy on the bottom, flip it over and repeat the process until it’s cooked and crisp on the other side. (I couldn’t manage to keep it all in one cake, so don’t worry about that — just do the best you can.) Serve immediately, preferably with runny poached eggs over the top. Combine the onions, garlic, and meat in the bottom of the slow cooker. Mix together all the remaining ingredients, pour over the meat, and stir to combine, breaking up the meat with a spoon. Cover and cook on LOW for 8-10 hours. Stir well before serving. This recipe will make enough sauce for 2 pounds of pasta. Combine all ingredients in a large bowl and stir well. Let sit at least 15 minutes before serving. (I made this in a large tupperware container, shook vigorously, and brought it to work with me; by the time I’d finished dropping the kids off and got to the office, it was perfect.) Makes approximately 4 generous servings. Preheat oven to 400 degrees and grease a loaf pan. Cream together butter, yogurt, banana, and maple syrup until smooth. Add the eggs, beating well, and vanilla. In a separate bowl, combine the flour, baking powder, baking soda, salt, cinnamon, oatmeal, and almonds. Gradually add to the wet ingredients, mixing just until everything is incorporated. Gently fold in the blueberries. Pour the batter into the prepared loaf pan and bake at 400 degrees for 60-75 minutes (you may need to cover the bread with foil if it begins to get too brown before it’s cooked through). The bread is done when a wooden skewer inserted in several places comes out clean. Allow the bread to cool completely before cutting. In a blender or food processor, combine the pistachios, 1 tablespoon of honey, and water until they make a smooth paste. In a medium saucepan over low heat, combine the egg yolks, 2 tablespoons of honey, salt, and cornstarch and cook, whisking constantly, until the egg yolks are pale and thick (about 5 minutes). Add the pistachio paste and cinnamon and stir vigorously for 1 minute. Slowly pour in the milk and cream, whisking constantly. Raise the heat to medium and cook, stirring occasionally, until thickened (about 10-15 minutes). Let the pudding cool to room temperature, then cover and chill until ready to eat. It will continue to set in the refrigerator. Combine the onions, carrots, and potatoes in the bottom of the slow cooker; add the split peas and ham and stir. Pour the water and stock over the vegetables and add the seasonings. Cover and cook on LOW for 8-10 hours; stir well before serving. 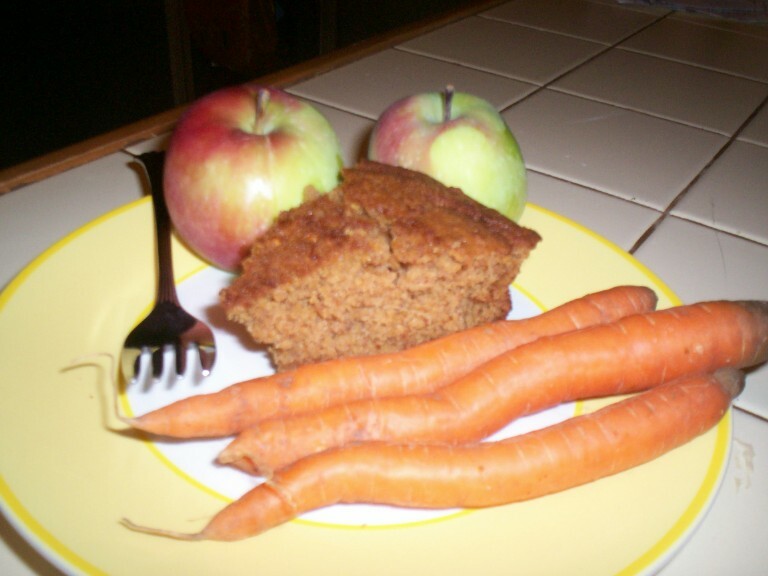 We served ours with homemade rye bread and sliced oranges and apples. Preheat the oven to 400 degrees. In a large pan, steam the cauliflower florets until just shy of al dente (if you pierce them with a fork, there should still be a bit of resistance). Drain and transfer to a 9×13 baking dish. In a small bowl, mix together the softened butter, cracker crumbs, cheese, and pepper until it holds together in clumps — it should resemble streusel topping. Scatter the topping evenly over the cauliflower. Bake at 400 degrees for 15 minutes, or until the crust is golden brown and crunchy. In a medium bowl, combine the sweet potato, egg, olive oil, nutmeg, salt and pepper. Beat quickly until it’s mainly smooth (a few small lumps are okay) and fully combined. Add the flour and stir to bring it together, then turn the mixture out onto a lightly floured surface and use your hands to quickly work it into a dough. You want the dough to be smooth and slightly sticky — it should stick to your hands just a bit, but not so much that you can’t work with it. (Add more flour as needed to achieve the right consistency.) Roll the dough into a long rope about 1/2 inch thick. Use a small, sharp knife to cut the rope into 1/2 inch sections. At this point, the gnocchi can be cooked as they are, but for better presentation and to help sauce cling more effectively to the gnocchi, roll each one gently over the tines of a fork, using slight pressure, until they have soft ridges in them. To cook gnocchi, bring a large pot of salted water to a boil just as you would for pasta. Put the gnocchi into the water and cook until they float to the surface, about 3-4 minutes. Drain, toss with sauce of your choice, and serve. Place the chicken pieces in the bottom of the slow cooker. Cover with the onions, garlic, and peppers. Mix together the spices (salt through oregano) and sprinkle evenly over the chicken and vegetables. Mix the vinegar, tomatoes, and stock, and pour over the contents of the slow cooker. Cover and cook on LOW 8-10 hours. To serve, remove the chicken from the sauce. Take the meat off the bones and shred. Discard the bones. Return the chicken to the sauce (or pour the desired amount of sauce over each portion of chicken; my kids don’t like as much sauce as we do). Use the chicken and sauce as the filling for flour tortillas; we top ours with avocado and a little sharp cheddar cheese, and serve alongside corn, beans, greens, and fruit. You could put anything you wanted into these quiches, really — we just used what was on hand, but this is a recipe that begs for personalization. Preheat the oven to 425 degrees. Lightly grease 8 muffin tins with cooking spray and gently press a piece of dough into each, forming a rustic, free-form crust. In a large bowl, whisk the eggs vigorously, then add the yogurt and milk and beat until frothy. Stir in the spinach, mushrooms, garlic, and spices until the spinach is broken up and evenly distributed. Fold in the cheese. Ladle the mixture into the prepared crusts, filling them to the top (you may have some filling left over). Bake at 425 degrees for 20-25 minutes, until the quiches are slightly puffed, golden, and feel set but still quite soft. Preheat oven to 375 degrees. Cream together the butter, granulated sugar, and brown sugar until smooth. Add the eggs and vanilla, beating until combined. In another bowl, combine the flour, cocoa, baking soda, and salt; gradually add to the butter mixture. Stream in the hot water and mix thoroughly. Fold in the crushed candy canes and chocolate chips. Form the cookies by rounded tablespoons on greased cookie sheets, about 1 1/2 inches apart. Bake at 375 degrees for 12-14 minutes, until starting to brown around the edges. Preheat the oven to 400 degrees. Grease a 9×9 baking dish. Combine berries, cranberry sauce, flour, sugar, spices, and half and half in a bowl; pour into the baking dish. In a small bowl, mix oats, flour, and brown sugar; using your fingers, rub the butter into the mixture until it becomes crumbly, with some large pieces and some small. Scatter the crumble mixture over the berry mixture. Bake at 400 degrees for 25-30 minutes, until golden brown and bubbly. Serve warm. Preheat the oven to 350 degrees and grease a 13×9 glass baking dish. Combine the cracker crumbs and melted butter, then press firmly into the bottom of the greased dish. Evenly distribute the white chocolate chips over the crust, followed by the dark chocolate chips, cherries, and pistachios, in that order. Pour the condensed milk evenly over the top. Bake at 350 degrees for 25 minutes, until golden brown. Allow to cool before cutting into bars. Preheat the oven to 375 degrees. Cream together butter, Nutella, and sugars until smooth. Add the zest, juice, and vanilla, then the eggs; mix until incorporated. In a large bowl, combine the flour, cocoa, baking soda, and salt. Gradually add to the Nutella mixture until just mixed. Spoon the batter onto greased baking sheets by rounded teaspoons, about 1 inch apart. Bake at 375 degrees for 12 minutes or until set. While the cookies are cooling, make the filling. In a saucepan over medium heat, melt the butter and marshmallows together. Working quickly, scrape the hot marshmallow into a mixer bowl and beat at high speed for 2 minutes to cool slightly (you must keep the marshmallow moving so it doesn’t stick and harden). Add the whipped cream and beat at high speed for about 5 minutes, until you see the mixer starting to leave tracks in the cream (the heat of the marshmallow will melt and deflate the cream quite a bit, so it will seem soupy for a while). Add the confectioner’s sugar and vanilla and beat at high speed for an additional 5 minutes or until thickened and fluffy. Chill. Once the cookies are completely cool, spread a teaspoon of filling onto the bottom of one cookie and press another gently onto the top. The filling may start to get runny as you work, but it will harden back up in the refrigerator. When all the cookies are filled, refrigerate them immediately to set the filling (they’ll also need to be stored in the fridge to keep them fresh and keep the filling together). In a 13×9 glass baking dish, melt together the butter, brown sugar, cinnamon, and nutmeg. Stir until smooth. Add the apples and craisins and combine until evenly coated. Spread the fruit out evenly across the bottom of the dish. Top with a single layer of the bread slices, filling cracks as much as possible (I trim leftover bits and stuff them into the cracks). Whisk together the eggs, milk, maple syrup, and vanilla, and pour evenly over the bread. Press the bread down to get it completely soaked. Cover the dish and place in the refrigerator overnight, or for a minimum of 8 hours. The next morning, preheat the oven to 375 degrees. Uncover the casserole and bake for about 45 minutes, until the top is golden and the liquid is absorbed. Sprinkle with cinnamon and serve warm. In a large pot over medium heat, saute the onion in the olive oil just until translucent, about 2-3 minutes. Add the sweet potato, carrots, and garlic, and cook for 5 minutes, stirring occasionally. Add the chicken stock, tarragon, salt, pepper, and orange zest; cover and bring to a boil. Reduce the heat and simmer for 20-25 minutes, until the potatoes are tender. Add the half and half and heat gently for another 2-3 minutes. Working in batches, pour the soup into a blender and puree until smooth. Adjust seasonings to taste. Preheat the oven to 375 degrees. Combine the oats and nuts in a large bowl. In a medium saucepan, combine the oil, honey, syrup, cinnamon, and salt. Cook over medium-high heat, stirring occasionally, until it’s just beginning to bubble around the edges. Pour the hot syrup mixture over the oat mixture and stir well, until everything is evenly coated. Spread the granola onto a greased sheet pan and bake for 10 minutes. Stir, then bake for 8-10 minutes more, until the oats and nuts are golden brown and toasted. Let the granola cool before removing it from the pan. Combine the dried fruits, tapioca, and water in a heavy-bottomed pot and let soak overnight. Add the apple and cinnamon stick to the soaked fruit and place over high heat. Bring to a boil, reduce the heat, and simmer, covered, until the tapioca is clear and the fruit is very tender (it should take about a half hour or so). Remove from the heat and stir in the sugar and juices. Classically, fruktsoppa is served chilled; it’s also delicious warm, if you can’t wait (we couldn’t). You can make this pot pie one of two ways: either as a skillet pot pie with a biscuit crust (using the Pumpkin Biscuit recipe on this page), or as a more traditional pot pie with a rolled pastry crust. I prefer the biscuit method because it’s easier and makes for a quicker dinner, but either is good! In a large skillet, melt the butter/oil over medium heat. Add the onions and celery and sweat for about 3 minutes, until they start to soften. Add the carrots and sweet potatoes and sprinkle with a little salt. Cook for about 8 minutes, until all the vegetables have started to soften slightly and release a bit of liquid. Add the mushrooms, thyme, salt, and pepper. Cook, stirring, for about 2 minutes more. Sprinkle the vegetables with the flour and cook for 1-2 minutes (the flour will start to form a paste). Gradually pour in the chicken stock, using a spoon to scrape the bits off the bottom of the pan; cook, stirring constantly for 2-3 minutes to keep the sauce from getting lumpy. Reduce the heat to a simmer and let the vegetables and sauce cook together for about 5 minutes, until the sweet potatoes and carrots are tender and the sauce has started to thicken. Add the cooked chicken and the frozen peas and stir to combine. Simmer over low heat for an additional 5 minutes to warm the chicken and peas through. Stir in the half and half to add richness and creaminess to the dish, taste, and adjust the seasonings as needed. At this point, you may either top with warm biscuits and serve, or pour the filling into a 2-quart casserole dish, add the top pastry crust (cut a few steam vents in the crust to prevent explosions), and bake at 425 degrees for about 40 minutes (watch carefully to be sure the crust doesn’t burn). Preheat the oven to 400 degrees. Lightly brush the tortillas on both sides with a little olive oil. Place the tortillas on a cookie sheet. Top each with about 1/2 cup chicken, 1/4 broccoli, any other vegetables you’re using. Sprinkle each with 1/2 cup of shredded cheese. Bake the pizzas for about 10 minutes, until the cheese is melted and bubbly and the tortillas are crispy. Cut into wedges and serve. This is not at all a sweet risotto — it’s really the savory side of pumpkin. I used homemade stock, which considerably cuts costs and improves the flavor. The goat cheese is optional (we didn’t give any to the kids), but J. and I both agreed that the tanginess of the cheese really balanced out the dish. Preheat oven to 375 degrees. Lightly grease 18 muffin tins (I only got 16 muffins, but I sort of over-filled mine). In a large bowl, cream together the butter, apple butter, and sugar until smooth. Add the eggs and mix well. In a medium bowl, combine the all-purpose flour, whole wheat flour, salt, baking powder, baking soda, and spices. Gradually add to the wet ingredients until everything is just incorporated (don’t overmix or the muffins will be tough). Pour the batter into the prepared tins and bake at 375 for 20-25 minutes, until golden brown and a toothpick inserted into the muffins comes out clean. While the muffins cool slightly, whisk together the ingredients for the glaze (you may have to adjust the amount of milk slightly to get a pourable, but not runny, consistency). Spoon about 2 tsp. of glaze over the top of each muffin while they’re still warm; allow the muffins to cool completely, then apply another layer of glaze before serving. Combine bulgur wheat, orange juice, honey, cinnamon, and salt in a saucepan; cover and bring to a boil. Reduce heat and simmer for 20-30 minutes, stirring occasionally to prevent burning and sticking, or until the liquid is absorbed and the bulgur is tender but not mushy. Stir in the almonds and serve hot, with a little milk poured over the top. Preheat the oven to 375 degrees. Combine all-purpose flour, whole wheat flour, oatmeal, baking powder, and salt in a small bowl. In another bowl, combine apricots, honey, and vanilla. Using a fork, work the apricot mixture into the dry ingredients until fully combined. Add water and oil and mix (I used my hands) until it forms a soft dough that holds together when squeezed. Turn the dough out and pat it into a 1/2 inch thick rectangle. Using small cookie cutters, cut out shapes (I used both animal shapes and some slightly larger flower and star shapes, but nothing larger than 2 inches diameter) and place the crackers on a lightly greased baking sheet. Bake at 375 degrees for 15-20 minutes or until golden brown and set. The crackers will become more crisp as they cool. Preheat the oven to 400 degrees. Lightly grease a baking sheet. Toss the chicken tenders together with all other ingredients in a small bowl and allow to marinate for 15-20 minutes. Remove the chicken from the marinade and place on the baking sheet; bake for 10 minutes, until cooked through. You could make sandwich bread with this recipe, too — it should make two good loaves. Combine the wheat flour, bread flour, and salt in a large bowl. Stir together the yeast, warm water, honey, molasses, and canola oil; let stand for 3-5 minutes to proof. Pour the yeast mixture into the flour mixture and mix well, until it forms a soft dough. Turn out onto a floured surface and knead, adding more flour if needed, until the dough is smooth and elastic. Pour a few teaspoons of oil into the bottom of a clean, large bowl. Put the dough into the bowl and turn to coat; cover with a clean towel and let rise in a warm place for about 45 minutes or until doubled. Punch the dough down and divide into 24 small balls. Place 12 balls in each of two lightly greased 9-inch cake pans; cover with clean towels and let rise again, about 45 minutes, until doubled in size. Bake at 375 degrees for 20 minutes, until golden brown. A toothpick should come out clean with no resistance, and the rolls should sound hollow when tapped. This is a recognizable knock-off of spanikopita, but the last time I made classic spanikopita, the kids didn’t seem crazy about feta cheese or about the big hunks of spinach that kept falling out. This time, I tried to tame the flavor by using milder cheeses; simplified the process of making the filling; and tried to make the texture of the filling a little easier for the small ones to handle. They were a big hit. 1 package frozen spinach, cooked, cooled, and squeezed dry in a kitchen towel — really get it good and dry! Preheat oven to 400 degrees. In a food processor, pulse the onion and garlic until minced. Add the spinach and grind for a minute until the spinach is finely chopped. Add the ricotta cheese, lemon zest, and lemon juice, and blend until the mixture is creamy and fully combined, but the spinach is not totally pureed. Scoop into a bowl, fold in the shredded cheese, and season with salt and pepper. Working quickly to keep the phyllo from drying out, lay one sheet of phyllo on a work surface and brush lightly all over with butter or oil. Lay a second sheet on top of the first and repeat. Keep going until you have four sheets of phyllo stuck together. Cut the phyllo crosswise into three rectangular sections. Place a heaping tablespoon of filling in the upper left corner of the phyllo rectangles. Fold the corner over the filling to create a triangle; then continue as though folding a flag, wrapping the filling up in the dough, until you have a neat triangle. Place the finished triangles on a lightly greased baking sheet, then continue the process with the remaining phyllo dough and filling (I got exactly 12 pies from this recipe). Bake at 400 degrees for about 10-15 minutes, until the phyllo is golden brown and crispy. In a food processor, blitz the flour and salt until just combined. Dissolve the yeast in the warm water and add to the flour mixture with the processor running. Keep the machine working until the dough starts to come together in a ball. Turn off the machine, add the olive oil, and pulse a few times just to incorporate it. Take the dough out of the processor and knead it quickly on a lightly floured surface, just until it’s a smooth ball. Lightly oil the inside of a large bowl and set the dough inside it, turning over a few times to coat. Cover the dough with a clean kitchen towel. From here, you can either allow the dough to rise in a warm place for 45 minutes, or put it in the refrigerator and let it rise for 24 hours. Once the dough has risen, punch it down and pat it out into a rough rectangle or circle. Pile the broccoli and garlic in the middle of the dough and begin kneading it in, folding the dough around the filling and pressing down to incorporate the broccoli into the dough. Keep working until the dough is studded throughout with broccoli (it will take a few minutes to incorporate all the broccoli — be patient!). Press the dough out onto a lightly greased sheet pan into a large rectangle, about 8×14. Bake at 450 degrees for 10-15 minutes, until golden brown; add the grated cheeses for the last few minutes of baking. Cool slightly before cutting into squares. I made this with the fresh pie pumpkin, which I roasted first; you could use canned pumpkin if you prefer, but it may end up being slightly sweeter. I’m not including a crust recipe because I just blitzed up some graham crackers with a little melted butter, then pressed them into muffin tins to make hand-held miniature pies for the kids. You could use whatever type of crust you’d like. Using a mixer, blend everything on medium speed until smooth and creamy. Pour the filling into a prepared crust and bake at 375 degrees — I did my mini-pies for about 30 minutes, just until they were set and barely moist to the touch on top. Whisk together the flour and baking powder and set aside. Beat the pumpkin pie filling, cider, and ricotta until fully combined. Pour the pumpkin mixture into the dry ingredients and whisk until it’s the consistency of a slightly thick pancake batter (it may be just a bit lumpy, because of the cheese). Drop by 1/4 cupfuls onto a buttered griddle and cook for 2-3 minutes per side, until golden and fluffy. This amount of batter will make around a dozen pancakes. One of the nice things about this recipe is that you can always adjust the texture — add more broth if you like it thinner, or make it with less for a thicker soup. We like ours on the heartier side. Heat the butter or oil in a large pot over medium heat. Saute the onions in the butter until soft and translucent, about 5-8 minutes. Add the squash, pears, and rosemary, and cook, stirring occasionally, for 5 minutes. Add the broth, cover, and bring to a boil; reduce the heat and simmer until the squash is very tender, about 20 minutes. Puree the soup (I use a hand blender for this, but you can transfer to a blender or food processor) until smooth. Add the cream, if using, and season to taste. You can also add more broth at this point if you want a thinner soup. I serve this with warm sourdough bread and a green salad, or with ham and cheese panini for a more filling meal. In a large, deep pot, combine the water, cider, ice cubes, salt, sugar, and crushed spices and stir until combined. Set the pork loin into the mixture, cover, and let sit for anywhere from 3 hours to 24 hours (we did ours for about 6). When you’ve finished brining the pork, remove the loin from the brine and pat it dry with paper towels. Combine the garlic powder, black pepper, and 1/2 teaspoon of salt and sprinkle all over the surface of the pork loin. Set in a roasting pan and roast at 375 degrees for approximately one hour; remove from the oven and let rest, covered with foil, for 15 minutes before slicing. As I mentioned in the post, we used a Boston Marrow Squash for this recipe, but you could use any hearty winter squash. Preheat the oven to 400 degrees. Place the bread cubes on a large baking tray and drizzle them lightly with olive oil, then sprinkle with a pinch of salt and pepper and toss to coat the bread. Toast in the oven for about 10 minutes, until golden brown and crunchy. Transfer the bread cubes to a large bowl and set aside to cool. Put the squash cubes on the baking sheet and toss lightly with a drizzle of oil, then roast at 400 degrees for 15-20 minutes, until fork-tender but not mushy. Add the roasted squash to the bread cubes. In a nonstick skillet, cook the diced bacon over medium heat until it starts to brown slightly and render its fat. Add the sliced shallots and cook until the shallots are soft and the bacon is crisp. Remove the shallots and bacon from the pan with a slotted spoon or spatula and add to the bread cubes and squash. In a small bowl or pitcher, whisk together the mustard, honey, and vinegar. Gradually add the 3 tablespoons of olive oil, whisking continuously until the dressing thickens slightly and is combined. Season with salt and pepper. Pour over the panzanella mixture and toss until everything is evenly coated. Let the salad sit for at least 20 minutes before serving. Serve room temperature. Cook the pasta according to package directions. While it’s cooking, heat about a tablespoon of olive oil in a nonstick skillet over medium heat. Add the garlic and saute for about 30 seconds. Add the chicken cubes and cook until it’s just starting to brown on all sides, but is not quite cooked through. Sprinkle the oregano, basil, parsley, salt, and pepper over the chicken, then pour the chicken broth over the top. Simmer for about five minutes, then add the tomatoes and scallions. Cook for about 2-3 minutes more, just until the tomatoes are softened a bit. Serve over the pasta with a sprinkling of Parmesan cheese, if you like. Preheat the oven to 300 degrees. Prepare a glass baking dish (either 8×8, which makes thicker bars, or 11×7, for thinner bars) by spraying with cooking spray, lining with parchment paper, and spraying the parchment again. Spread the oats and sunflower seeds on a dry baking sheet and toast in the oven for about 10-15 minutes, just until the seeds are slightly golden and warm. In a small bowl, mix the pureed dates, cocoa powder, and vanilla (I recommend using a fork) until they’re combined — the mixture will be dry and crumbly. In a small saucepan over medium-high heat, combine the oil, brown sugar, and honey, stirring until it’s melted together and is a thin syrup. Turn off the heat and add the date mixture to the syrup. In a large bowl, combine the toasted oat mixture and the date syrup. Stir until everything is evenly coated. With damp hands, press the mixture into the prepared pan and spread until it’s even. Bake for 30-40 minutes, just until it’s set and the top feels nearly dry to the touch. Cool for 30 minutes in the pan, then remove from the pan and chill for at least 1 hour before cutting into bars. We got 16 servings from an 8×8 pan. Preheat the oven to 375 degrees and line or grease 24 muffin cups (or you could make mini-loaves; the recipe will make 4 mini-loaves). Beat the sugar, yogurt, and oil until smooth; add the tomato puree and mix until completely combined. Whisk together the dry ingredients and gradually add to the wet mixture until fully incorporated. Pour into prepared muffin cups or loaf tins and bake at 375 for 30 minutes (muffins) or 45 minutes (loaves), just until set and a toothpick comes out clean. These muffins are very delicate and may sink slightly in the centers, but will still be delicious. I recommend storing in the fridge. *NOTE: To make the fresh tomato puree, peel the tomatoes — the easiest way is to score the skins with an “x” on the bottom of each tomato, then blanch them in boiling water for 30-60 seconds and submerge them in cold water. The skins should slip right off. 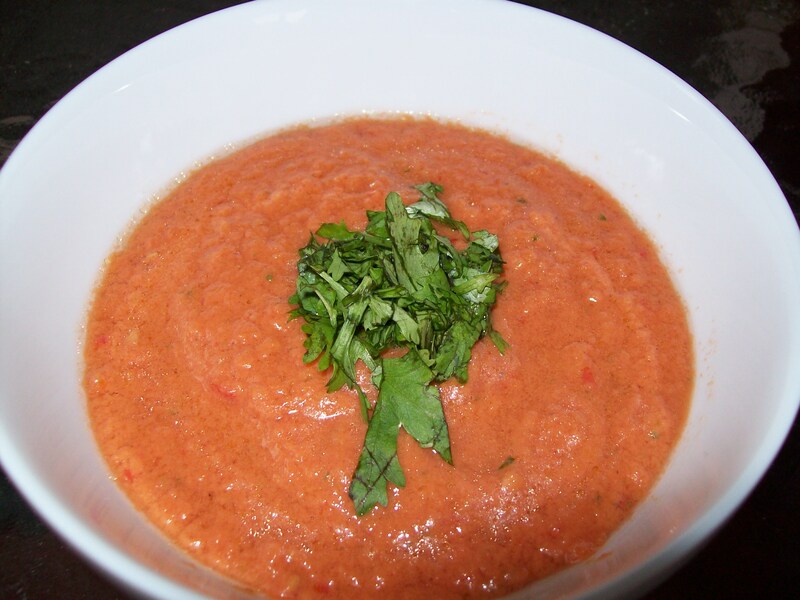 Then just use a food processor or stick blender to puree the tomatoes. Preheat the oven to 350 degrees and prepare 18 muffin cups, either by greasing or lining. Cream together the butter, yogurt, and sugar until smooth. Add the beets and mix thoroughly; add the eggs, one at a time, and vanilla. Combine the dry ingredients in a separate bowl. Dissolve the molasses in the hot water. Add half the flour mixture to the beet mixture and mix briefly, then add half the molasses and water. Repeat with the remaining flour and water, mixing just until all the ingredients are incorporated. Spoon the batter into the prepared muffin cups and bake at 350 degrees for 20 minutes, just until a toothpick comes out nearly clean. Preheat the oven (a toaster oven works fine for this) to 350 degrees. In a small pan, combine the oil, honey, maple syrup, and cinnamon. Bring just to a boil, stirring, and remove from the heat. Pour the hot syrup mixture over the Cheerios and oats and stir to combine. Spread the mixture onto a greased baking sheet and bake for about 10-15 minutes, just until golden brown. Allow it to cool slightly before handling. While still warm, remove from the pan and crumble it into small pieces. Use to top apples, yogurt, or anything else you’d like — or just eat it as a snack on its own. *Note: if you use frozen peas, thaw them first under cool running water, then dry them thoroughly on paper towels. If they’re wet, the recipe won’t work. Preheat the oven to 400 degrees. On a large baking sheet, toss together the peas, olive oil, and kosher salt. Scatter the peas evenly over the baking sheet. Roast them for 15 minutes, then check them. If they’re a deep golden brown color, crisp in texture, and smell slightly nutty, they’re done. If not, continue roasting them and checking every few minutes. Once the peas are done, you can either just cool them and eat as they are, or you can toss them with any sort of spices you like while they’re still warm (wasabi powder comes to mind, if you’re a fan of wasabi peas). Preheat the oven to 400 degrees. Lightly grease a baking sheet with cooking spray. In a medium bowl, combine the flour, salt, baking powder, and cardamom. Using two knives or a pastry blender, cut in the cold butter until the mixture resembles coarse breadcrumbs. Make a well in the middle of the dry ingredients and add the cream and syrup. Mix just until everything is incorporated. Using a 1/4 cup measure, drop the scone batter onto the baking sheet — you should get about 8 scones. Bake for 20 minutes, until golden brown and set. Preheat the oven to 375 degrees. Spray a glass baking pan, 11×7 inches (you could also use a 9×9 square) with cooking spray. In the bottom of the prepared baking pan, stir together the melted butter, peach sauce, ginger, and 1/4 cup of the brown sugar. Using a mixer on medium speed, blend the banana, milk, remaining 1/4 cup of sugar, and egg until smooth, then turn the speed to low and add the pancake mix, beating until just combined. Evenly spoon the batter over the peach sauce mixture (be careful not to swirl the two together). Bake at 375 for 35-40 minutes, until golden brown and springy, and a toothpick comes out clean. Let cool before serving. As mentioned on the blog, I’ve tried other people’s methods for these, but this is the way that it works best for me. You may have a different experience. I just think that my way — which is lower and slower, even, than most recipes — really gets the moisture out of the fruit and keeps it crunchy, while also eliminating most of the chance of browning and tasting burned. Preheat your oven to 200 degrees. Slice the apples very thinly, about 1/8 inch thick, stopping when you get to the core. Slice the banana on the bias, also as thinly as possible, using a very sharp knife to get a clean cut so you don’t smash the banana and have a big mess on your hands. Spray a nonstick baking sheet with cooking spray and lay the apple and banana slices on it in a single layer, not overlapping or touching at all. Bake at 200 degrees for about 3 hours, checking and turning after 2. The chips are done when they are very dry to the touch, seem crunchy, and move easily when you shake the pan. Let them cool completely. Put the cooled chips into a ziploc bag with the cinnamon and sugar, shake to coat, and leave in there for storage. They should last up to a week. Less of a recipe, more of a method – but a tasty, easy way to present fruit to little ones (and adults — J. ate a spoonful every time he passed the bowl). Toss the cut-up fruit into a large pot. Run cold water into the pot until there’s about an inch in the bottom. Cover and set over high heat. Bring to a boil, reduce the heat to low, and simmer the fruit for about 20-30 minutes, until it’s really tender and starting to break down. Set a food mill fitted with a medium blade over a large bowl (if you don’t have a food mill, get one immediately). Working in batches, spoon the fruit and juice into the mill and grind it through. The food mill will catch any bits of seed or peel that shouldn’t go into the finished product. Once the fruit is all pureed, add the sugar and spices and stir to dissolve the sugar. Let cool before eating, if you can stand to wait. Sweet potatoes and bananas go great together. I have a habit of using sweet potato or pumpkin as the base for lots of different muffins — I like how they both add moisture and flavor to the muffins, while giving a lot of nutritional value to the finished product. Although I sometimes substitute yogurt for some of the oil or butter in a recipe, I haven’t done that yet with these — I think they benefit from the buttery taste. Preheat the oven to 375 degrees and prepare 14-18 muffin cups (this recipe makes just over a dozen, but not always a dozen and a half…go figure!) Beat the first six ingredients (sweet potato through vanilla) at medium speed until smooth and silky. Combine the dry ingredients and gradually add to the wet mixture, mixing until just incorporated. Pour the batter into the prepared muffin tins and bake at 375 for 20-25 minutes, until a toothpick inserted in the middle of a muffin comes out clean. I want to use up some mashed sweet potatoes that I made this weekend. About how many cups of mashed potato do I use for your sweet potato-banana muffins? They have a little orange juice and orange zest in them, will that make the muffins taste funny? Erica, great idea and great question! My best guess is that it’ll be about 2 cups of mashed sweet potato that you want; one large sweet potato should yield about a cup of mashed. I would imagine that the orange juice and orange zest will make the muffins taste GREAT! Let me know how they turn out! B. , seriously, that glaze for the apple butter muffins is divine. I would have gladly basted myself in it if I had enough powdered sugar. I used it to glaze some pumpkin muffins that I made. 🙂 So glad you liked it! I know, J. and I were licking the plate after the glaze dripped off the sides of the muffins and pooled underneath them. I bet it was DELICIOUS on pumpkin muffins. I haven’t made pumpkin muffins in a long time — you just gave me an idea! I was going to send you the recipe and see if you would gussy it up for more nutritional punch. I was definitely disgusted at how much sugar it called for, but it didn’t stop me from making them since they weren’t staying in my house for me to consume the whole batch. I know, I know. I’m contributing to the downfall of the school staff. I’m terrible that way — I always contribute to the downfall of other adults! Recently a member of the office wellness committee proposed that we enact a ban on people bringing their leftover sweets etc. from home to share with the office, and I actually thought “Are you kidding me??? ?” It was partly because I felt like, as with the vending machines, we’re all adults and we can all make our own decisions about treats; and partly because I completely confess to using the office kitchen as a handy escape route to get excess sweets out of our house! I usually use a pumpkin bread recipe that I got years ago from Cooking Light, which turns out pretty well, but I’ve been thinking of other ways to re-invent that too, so I’d be happy to take a look at your recipe and see what we can do with it! just happened upon your blog. very interesting read and looks like some good recipes as well. one question. have you ever tried using agave nectar for sweetener? i have seen it in the market, but have not tried it yet. just wondering. 1) I try to use mainly ingredients that either would have been used/recognized by my great-grandparents (ala Michael Pollan’s work); or ingredients that are whole foods. For example, my great-grandmother wouldn’t have had the faintest clue what to do with an avocado, but at least it’s a whole food product. 2) Research on high levels of fructose, which is present in agave (depending on the brand, agave is anywhere from 55-95 percent fructose — often more than HFCS, according to various reports), shows that it can be damaging to the kidneys and liver. I’m sure in moderation, as with anything else, it might be fine for someone whose liver and kidneys are in perfect working order, but my husband has a mild genetic liver disorder which may have also passed to our boys, so I feel it’s wisest to stay away from high-fructose products to avoid accelerating the damage to his liver and theirs. 3) Anything that has that much controversy swirling around it — think trans fats, saccharine, aspartame, red dyes, HFCS — generally proves to be a problem after enough research is done. I feel much more comfortable using sugar, honey, and molasses in moderation than introducing a product that is the subject of so much debate. However, as I said, that’s how I made my decision. Your decision may be entirely different, and if you do choose to try it, let me know how it goes! Just tried the Banana-Oatmeal cookies. Kid approved and gives me another avenue in which I can get A. to eat bananas. Both A. and K. loved helping make them. Thanks! No problem! Glad the kids had fun making them, and glad they liked them. Our boys really go crazy for these, and they’re so simple to make.